Nifty has formed a Tri-star doji at the TOP over last 3 days, same was also observed at 6000 TOP of Jan 2008.. 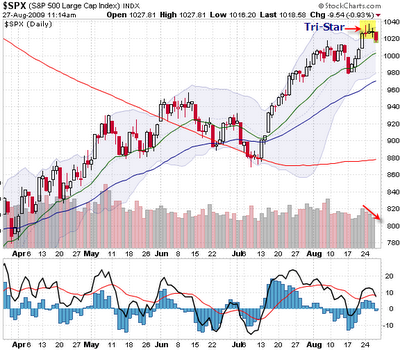 Bearish Doji Tri-Star: Indicate the end of a uptrend and beginning of downtrend. The requirements is that it should be formed after a significant uptrend. This pattern indicates stop of the prior trend. This is a significant reversal indicator. Any fall below 4780, can lead to target of 4740 4700 4680 4600. SL 4850.